FIVE months ago Battistelli made a notable visit which we wrote about in [1, 2]. Monaco is a ‘country’ whose vote is rather cheap to buy. The EPO can control even rich countries, provided they’re small enough (like Monaco). It’s an evident, obvious design flaw when the vote of a country like Germany carries the same weight as Monaco’s. A couple of days ago the EPO published (caution: link to the EPO’s Web site, which means the EPO can harvest IP addresses) something familiar. The Corsican in Chief can have a little chat in French and then take another photo op for perceived legitimacy. Photo ops of Battistelli with officials of tiny ‘nations’ (whose officials have been easy to ‘buy’ for their vote/support) have become quite a routine modus operandi. Why does this matter (or does not matter? 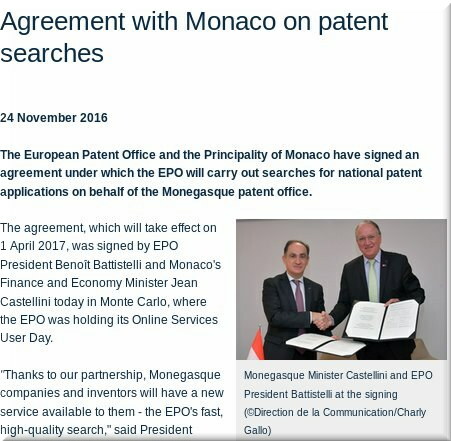 Did you see the puff piece about the agreement with the Monégasque patent office? Not one patent application was published by Monaco in 2016 and it looks like they average around three per year. Hardly worth the bother travelling to Munich for that but at least the ambassador got to visit the out of bounds floor of the EPO. People, do not make yourself too many illusions! Battistelli has already announced that he intends to further prolong his mandate. He has the support of the small contracting states whose votes he buys with plenty of cooperation money (there is no control on this and plenty of money is available). He will proceed this way: 1) make sure that the post is not timely announced; 2) make the sacrifice and accept to remain at the request of the majority of the small states. A very simple strategy. The big contracting states will have to accept: France for the pride: UK does not exist; the Germans do not care; the Dutch will have their building; Italy is totally irrelevant etc. A disaster for the EPO ! So Merpel, not even curious what the B28 decided yesterday about the selection of the new EPO President? Which countries are in the running? Or is it extension time? Chances of a post or pre Brexit UK President?? Timed to encourage signing that UPC document? The possible machinations and plotting could be infinite. Maybe even not an AC member for the first time? An external CEO, but with little or no IP knowledge? Who knows? That’s Antonio Campinos, who some believed would replace Battistelli.